As known to all, Ranveer Singh's high-octane energy is infectious and unmatchable. The actor is always in the happy mood and we cannot stop loving him for that. Fans around the world admire the actor for his this entertaining quality and so does his girlfriend Deepika Padukone! Last night, Singh returned to Mumbai city after a 2-month long schedule in Hyderabad for his upcoming film 'Simmba'. The actor just like usual arrived in style and had his energy on point. 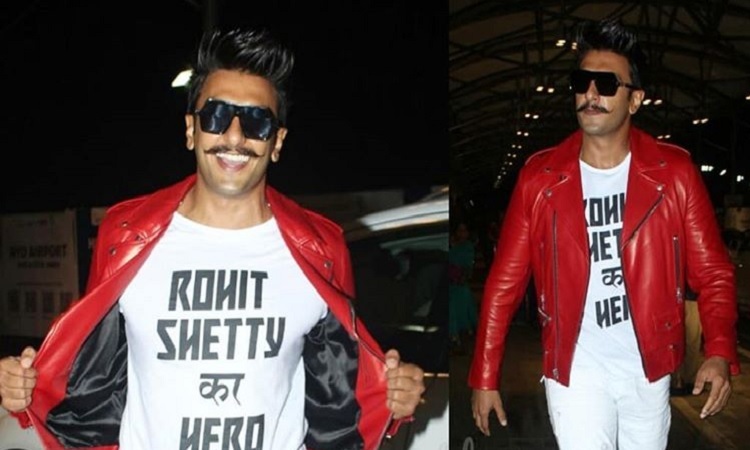 He returned but not without declaring that he is 'Rohit Shetty Ka Hero'. He teamed a white Tee with a hot red jacket and white pants. The actor was undoubtedly in the Simmba mood and this energetic video will bring a smile to your face! About the film, Simmba is the Hindi remake of Telugu film 'Temper'. Currently, the cast completed the first schedule of the film at the iconic Ramoji film city in Hyderabad. Directed by Rohit Shetty, this film stars debutant Sara Ali Khan as the female lead. Simmba is slated to hit the theatres on 28th December this year!